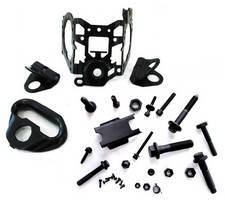 Surface Finish Coating provides stable black appearance. Developed for screws and other fasteners in visible areas for automotive industry, coating system comprising matt zinc flake basecoat DELTA-PROTEKTÂ® KL 120 and water-based black topcoats DELTA-PROTEKTÂ® VH 321 GZ and VH 322 GZ fulfillsÂ corrosion protection requirements while simultaneously giving components stable, black surface. Properties reduce white corrosion while promoting adhesionÂ as well asÂ resistance to abrasion while meeting respective coefficients of friction. Grass Lake, MI — Dörken MKS-Systeme GmbH & Co. KG, Herdecke, Germany and parent company of Dörken Corporation USA located here has introduced a new coating system that provides fasteners with both high performance and durable black corrosion protection. The new coating, which represents an addition to the black coatings of the DELTA-MKS® product series, consists of the matt zinc flake basecoat DELTA-PROTEKT® KL 120 and the water-based black topcoats DELTA-PROTEKT® VH 321 GZ and VH 322 GZ. Together, these coatings provide effective reduction of white corrosion, excellent adhesion and resistance to abrasion while meeting the respective coefficients of friction. The new system was developed specifically for screws and other fasteners for use in the automotive industry and meets several auto standards. Black surfaces are in increasing demand for use in areas that are visible. So far it has proved difficult to meet the complex requirements of manufacturers with the premium appearance customers expect. The new system fulfils the requirements of the automotive industry with regard to corrosion protection, while at the same time giving components a stable black surface. With an overall layer thickness of 18 µm depending on the structure of the layer and geometry of the parts, corrosion durability of 840 hours as per DIN EN ISO 9227 is achieved. Further, white rust resistance of 240 hours is significantly exceeded. The basecoat guarantees active cathodic protection and optimized adhesion to steel while the topcoat ensures higher chemical resistance, the consistency of the coefficients of friction and satisfies temperature resistance requirements. The system can be applied using all standard methods, such as dip, dip spin or spray. The choice of procedure depends on the size and geometry of the parts. A further advantage of the new system is its compatibility. This enables the new matt basecoat to also be combined with other top coats of the DELTA-PROTEKT® and DELTA-Seal® product range. Dörken’s global coating solutions are approved for use by and meet the standards and specifications for corrosion protection, sealants, and lubricity performance of fasteners of vehicle manufacturers and Tier One suppliers worldwide yet are environmentally friendly. Its product development programs and manufacturing operations are certified in accordance with DIN EN ISO 9001:2000 and to ISO 14001.